Being less than a year old when Partick Thistle won the Scottish League Cup in 1971 it was a while before I got to see them win anything. Mine is a team which you follow more in hope than in expectation. This made the league title triumph last year all the more special. Part of our reward for finally emerging from the First Division is the chance to get away from playing the same old teams year on year, ad nauseam. Some old rivalries are re-visited, such as with St Mirren this weekend. It feels like a meeting with distant cousins that you haven't seen for a decade but immediately fall into the same old conversations you were having back then. St Mirren have followed a similar up and down history to Partick Thistle and their League Cup success of last year was a rare high for the team and manager Danny Lennon. The last time that I was in St Mirren's old ground at Love Street was in 2002. Danny Lennon was captain of the Thistle team that day I think, with Alan Archibald and Scott Paterson playing alongside him. Today they would all be in opposing dug-outs. Derek Fleming scored the second goal that day, breaking his leg in the process, but securing our promotion and exacting revenge on the team who had relegated us here six years earlier. That match was marked by my wife wearing a soggy Scotch pie whilst we drank curry flavoured champagne on the way home. When Thistle's first goal went in somebody's pie was launched high into the air as we all leapt to our feet. It came down with sufficient force to kind of explode on landing on my wife's head, being mushy enough to give her hair the full hot oil and mutton beauty treatment. Planning ahead we had a bottle of bubbly with us in case promotion was secured and had picked up some polystyrene cups from a local shop in case we had the chance to drink it. 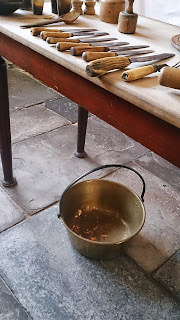 Unbeknown to us these appeared to have been stored beside the shop's spices and carried a pungent curried aroma which they flavoured our celebratory drink with. Curried champagne, you should try it. Since that day St Mirren had gone and got themselves a new stadium, so there was the added pleasure of ticking off another ground I had never been in before on today's visit. As I had ran the Paisley Life 10K last weekend through the streets of the town I had a wee idea where I was going this weekend as the race route went around the abbey and then out past St Mirren Park, the 8,000 capacity ground the team have been playing for the past four years. 1500 people ran the race that day and we brought that plus an extra 100 to town with our usual decent travelling support. When we slumped down through the divisions in the late nineties I kept going along to games despite, I think, going for 2 years without catching a Partick Thistle victory. Part of the draw at that time for me was the strange wee towns I got to see. It is unlikely I would have visited Forfar, Methil or Arbroath in those years if it wasn't for the sake of following my team around the country. I do hope that some of The Rangers fans doggedly watching their team through the lower leagues manage to enjoy the experience and maybe reconnect with what football means to some of the people in these places. Even if it is just the excuse to wander into a local boozer that you wouldn't normally go near, wearing the football scarf of an visitor gives you permission to come in and usually triggers off some random conversation with a complete stranger. I usually like pitching up a couple of hours early and having a wee stot about beforehand to get a feel for the place or pretend I'm a tourist just arrived from outer space to see what they'd make of my country. Despite Paisley being only a few train stops away I have never really spent much time in it since Arnotts shut down and my granny had no reason to be driven here. When I was previously addicted to tracing my family tree it all led down in this direction, I can trace them back to farmland just south of Paisley in the 1640s. Then over the next few hundred years like many people in this part of the world at that time, weaving became their trade, before their descendants followed the heavy industries into Glasgow. 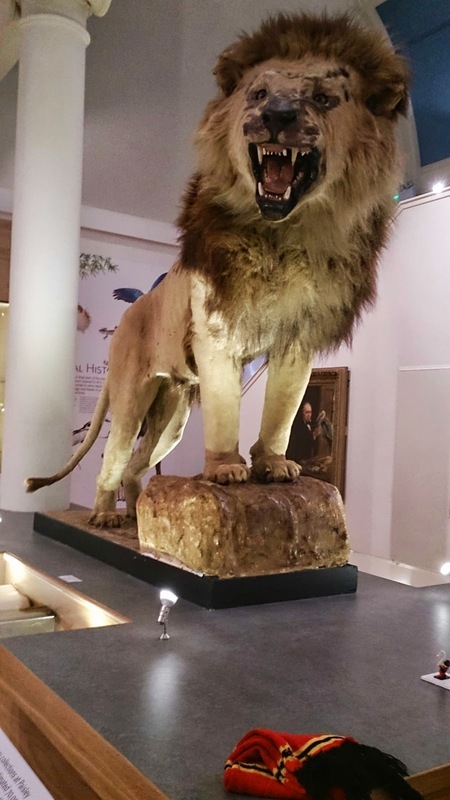 With my children in tow for the football at 3pm I arrived nice and early in Paisley and looked around the Paisley Museum. We didn't have time today to look around the Coats Observatory which is part of it, Scotland's oldest public observatory. It was gifted to the town by the Coats family who made their fortune in the silk thread and weaving industry the town was famous for throughout the world. Less impressive than the Paisley pattern and Paisley shwls on show is Buddy the moth-eaten lion, sufficiently famous in these parts to justify the balloons on sale in the shop announcing that "Buddy the lion is back in Paisley!" Following the weaving thread (gerrit?) we headed to Sma' Shot Cottage, an old weavers cottage in the town which shows you living conditions and looms from the times before the industrialisation of weaving, when people worked at their own looms at home, like my ancestors in nearby Kilbarchan. 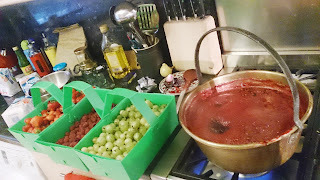 Amongst the olde worlde stuff on show I liked the jeelie pan lying on the floor, because we had picked a lot of berries recently up the road at East Yonderton Farm and made jam using one identical to this, which used to belong to my wife's great-granny. The volunteers working there were falling over themselves to tell us all about the history of the place and that of the Sma' Shot strike of 1856. The guide was a pains to tell us that the annual Paisley Sma' Shot day that marks the anniversary of the strike is not commemorating the gifting of the fee by the bosses as the local paper apparently claimed last year, but to mark the efforts of the strikers who forced it out of them. The "Sma' Shot" was a hidden thread that held the delicate work of these Paisley weavers together. Despite the thread being an essential component of their work, as it was hidden it was felt that this thread didn't merit payment. With rebellion in the air across Europe at that time the weavers had the full force of the law brought against them and were taken to court. A member of the Coats family, who were not exactly impartial observers in the dispute, was on the jury of the case and apparently pushed for compromise at that late stage and they were awarded their payment. 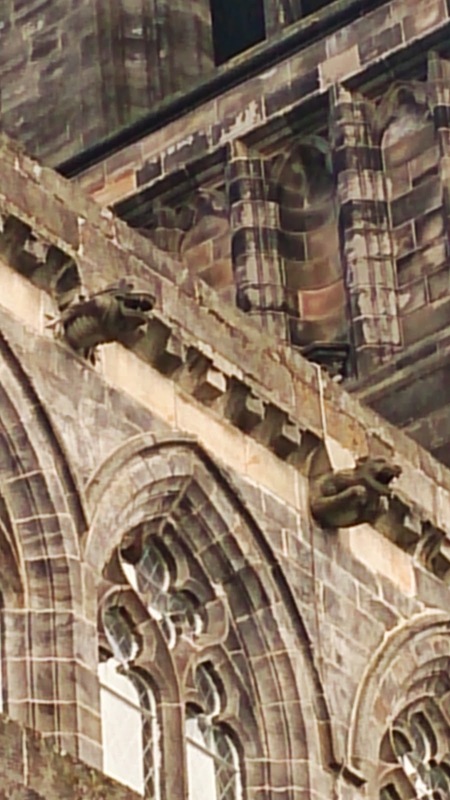 As it is celebrating its 850th anniversary this year we also stuck our heads into Paisley Abbey. It was established in 1163 on the site of an old Celtic church founded 600 hundred years earlier by St Mirin. It is thought to be where local Renfrewshire lad William Wallace was educated by the monks of the abbey. It wasn't until 1877 that St Mirin got round to founding a local football team in his name to keep the local weavers distracted when they weren't at work or church. The abbey has undergone restoration work in recent years and new gargoyles were commissioned as part of this. 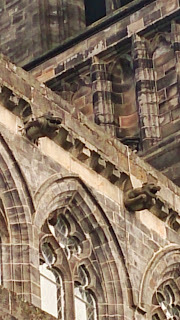 Amongst some of the wackier ones can be seen an Alien style monster emerging from the side of the abbey in the style of one emerging from John Hurt's stomach. Briefly peering through the windows of the home of "the weaver poet" Robert Tannahill en route, we walked up to St Mirren's new ground. There was a fantastic crowd behind the goal at the Thistle end for the match (BBC highlilghts available here to viewers in the UK), although our players tried to pick off a few with their pre-match shooting practice. About a dozen stray shots were blasted at us and one unfortunate ricochet caught a more elderly fan on the back of the head knocking him down the stairs where his fall was broken by another. Patched up by the St Andrew's ambulance first-aiders he was thankfully able to watch the match, but we had a measure of where Thistle's shots would be aimed for the first 80 minutes of the match. If points were awarded in this league for passing and possession I am pretty sure we'd have a European place in the bag by Christmas. Unfortunately it is goals that points get awarded for and that proved more elusive for us. Thistle shouts for a penalty went unheeded by Willie Collum as Baird was bundled over in the box and clear chances were in short supply at the goal under us in the first half. Against the run of play St Mirren scored after 50 minutes when a cross from the corner was turned in at the near post. Thistle just kept playing football though. Pass, pass, pass our familiar mantra from last season. Eventually after a wee back-heel from Craigen I think, Higginbotham swept it into the net from the edge of the box and two minutes later Forbes's left foot turned defeat into victory. Every point this season could be important but these were 3 points I thoroughly enjoyed watching us get. Unfortunately for Danny Lennon, despite his recent League Cup success this means his position is now under pressure and St Mirren are only kept off the bottom of the league by Hearts and their 15 point deduction. With that I'll leave you with Robert Tannahill's words, maybe he is thinking of St Mirren with these lines. On A Crabbed Old Maid. Her grave 's o'ergrown wi' thistles.